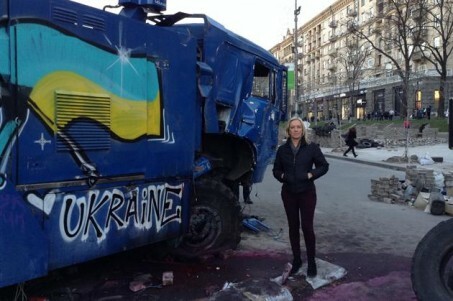 A weekly newspaper’s village correspondent stepped out of her comfort zone – to report from the “frontline” in Ukraine. The KM Group’s Melanie Wright left the parish boundaries of the tiny Kent community she covers to interview people caught up in the tension and conflict of Kiev. Medway Messenger editor Bob Bounds said the assignment came after Melanie discovered one of the 209 residents on her patch – Cooling – was from Ukraine. He said: “She became friends, and when Niyole Stratford decided she needed to go back to her homeland with her English husband, Melanie went with her. Mum-of-three Melanie described the experience as both scary and thrilling. She said: “People wanted to tell me their stories and I came back with several books of notes. She accompanied Niyole and her husband Mark to Kiev after Niyole felt helpless viewing on TV the bloody clashes to oust President Viktor Yanukovych.